Unify Your Communications, Messaging, and Collaboration NEC's UC Suite for SMBs delivers the tools that will increase performance throughout your organization. The UC Suite gives you and your employees access to the latest productivity- enhancing communications applications, such as user presence, instant messaging (IM), whiteboarding, application sharing, a multimedia softphone, and your UC client. The UC Suite delivers on the promise of unifying your business's communications by integrating seamlessly with Microsoft® Outlook® and CRM applications. Our innovative UC Suite ties your organizational communications into your core business processes while also helping to increase employee productivity, shorten response times, encourage collaboration, and improve customer satisfaction. Unified communications (UC) is a marketing buzzword describing the integration of real-time enterprise communication services such as instant messaging (chat), presence information, voice (including IP telephony), mobility features (including extension mobility and single number reach), audio, web & video conferencing, fixed-mobile convergence (FMC), desktop sharing, data sharing (including web connected electronic interactive whiteboards), call control and speech recognition with non-real-time communication services such as unified messaging (integrated voicemail, e-mail, SMS and fax). UC is not necessarily a single product, but a set of products that provides a consistent unified user-interface and user-experience across multiple devices and media-types. UC allows an individual to send a message on one medium, and receive the same communication on another medium. For example, one can receive a voicemail message and choose to access it through e-mail or a cell phone. If the sender is online according to the presence information and currently accepts calls, the response can be sent immediately through text chat or a video call. Otherwise, it may be sent as a non-real-time message that can be accessed through a variety of media. Mobile simplicity is invaluable in a corporate environment muddled with e-mails, phones and faxes. Unified Communications makes all internal and external communications content available on your PC or smart phone (iPhones included) in familiar Microsoft® XP/Vista-based applications. A solid headquarters is just as important as a mobile workforce. With Unified Communications, your phone operators can simultaneously reference a detailed profile of every caller while viewing their touch point status on your network. It's difficult to monitor each customer's experience with your company -- unless it's clearly displayed on a screen in front of you. Spend less time shuffling through your inbox and more time collaborating with your colleagues. To learn about UC for Business, call Midwest Telecom today. Streamline existing communications infrastructure with one simple application. • Manage customer touch point experience from one desktop. Instantly access colleague status information, including whereabouts and availability. Contact Midwest Telecom today, for more information at 812-421-0111. Employees become more mobile and productive. Advanced UC applications such as softphone, white boarding, and application sharing. Imbedded on the SV9100, on an external server or in a Virtual Machine environment the choice is yours. Simplified call management through an easy-to use graphical user interface. User Presence for real time status and availability of colleagues. Instant messaging for quick, real time conversations. Easy capture/upload of profile pictures to be associated with Busy Lamp Field (BLF) and company directory. Internet browser access to features through UC Web Client. Quick access and easy management of messages through the integration with UNIVERGE InMail and UM8000. Innovative application that increase efficiency and productivity. NEC’s UC Suite unifies your business’s communications by managing them through your PC or mobile device. The UC Suite Client allows your employees to get more done in less time by providing them easy access to features such as hold, transfer, conference, enhanced park, page and barge-in. Call management, speed dialling and contact lookup. Access to integrated contact and CRM applications. Presence to view colleague’s real-time status and availability. Visual voicemail for quick access to and easy management of inbox and messages. Instant messaging capabilities for quick, real-time conversations. 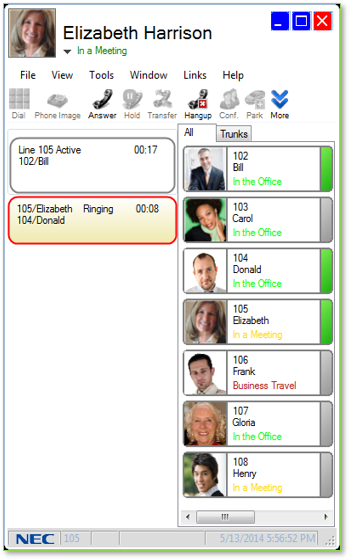 Attendant console capabilities directly on an operator’s PC, allowing them to transfer and manage calls on-screen. Detailed call history reports - includes incoming and outgoing calls, call date and time, call duration and caller ID. Ability to search, sort, print, archive, email and export call logs plus add notes to call log entries. Call recording capabilities - either on a per call basis or setup to automatically record all calls. 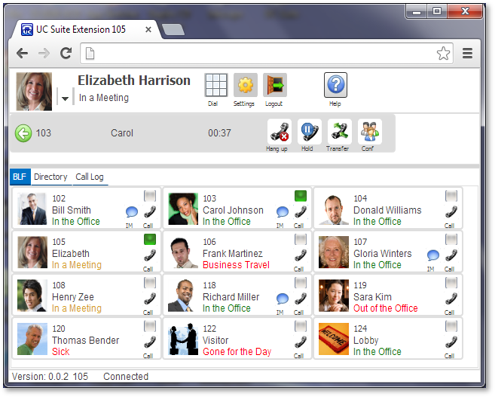 UC Suite also allows you to customize the look and feel of the UC Suite Client. It enables you to change the colour scheme of the main and instant messaging windows, and upload a picture to be associated with your profile entry. You choose which view you would rather see. Contact us for all the support and advice you need for Unified Communication. We proudly serve Evansville, IN, and the surrounding area.